Abdominal Cuts Sport - Diet Pill Reviews: Does Abdominal Cuts Sport Really Work? Abdominal Cuts Sport is another weight loss supplement in a long line of similar fat reducing products by Corr-Jensen Labs. This particular formula is specially designed for men – to provide that extra edge at the gym that helps them increase size while keeping pockets of fat at bay. 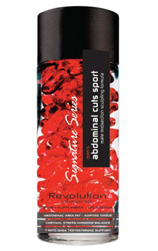 Abdominal Cuts Sport claims to help boost the natural production of testosterone in a man’s body to help him build a health physique during his regular weight training sessions. At the same time, this product includes fat reducing ingredients to keep the midsection lean and trim. Abdominal Cuts Sport includes many of the standard ingredients found in all of the Abdominal Cuts formulas, but adds a few extras of its own as well. Conjugated linoleic acid (CLA) is found in all the Abdominal Cuts products, due to its ability to help the body break down fatty acids and boost the metabolism. Like the women’s version of Abdominal Cuts, this formula combines CLA with sesamin to enhance the effects of the CLA. Gamma oryzanol is also included in the Abdominal Cuts Sport formula, due to its perceived ability to boost testosterone levels in men. It is a supplement that is commonly used by athletes and body builders for this purpose. In addition to boosting testosterone levels, gamma oryzanol may also increase the body’s own fat burning ability and improve sexual function. However, the jury is still out on just how effective this ingredient can be in any of these areas. The final ingredient listed on the Corr-Jensen website is 7-Keto, which is another ingredient that is making its way into a number of weight loss supplements today. This substance has been found to promote muscle growth, which is why it tends to be a popular choice for body builders. Initial evidence also suggests that it might be effective in promoting fat burning within the body as well.